I bought tickets to see The Script on their No Sound Without Silence tour for Chloe for Christmas and it finally happened gaaaaa. I love them sooo much and haven't seen them since their #3 tour two years ago, so Thursday night was greaaaat. They were incredible. I think they're probably my favourite band ever. They've got that special something that just stands them way above the rest for me; I think it's the soul they put into their music, and that comes out so clearly live. It was probably one of my favourite gigs I've ever been to, maybe even my favourite one. Their music really is unlike any other, and they're so passionate, and a band that really are just in it for the music. And you don't get that much, so they really are very special to me. They opened with Paint the Town Green, which is pretty much a song about their love of Ireland, where they're from. They came out from the back of the arena, walking down the sides with lit-up green flags, parading them to the front, looking more than ready to put on a great show. They played so many songs from the new album, like Superheroes, Hail Rain or Sunshine, No Good in Goodbye and more, as well as a number of classics, including Breakeven, Before the Worst, Nothing and Hall of Fame, and they filled up over an hour and a half with all the music they could fit in. Their B stage was so lovely as well, and they really played their hearts out in the middle of the arena, with The Man Who Can't Be Moved blowing every person in the room away. It was a surreal moment and I'll never forget it. Their songs have so much depth and feeling within them, and I really got caught up in it, my eyes watering and my heart swelling during If You Could See Me Now. Man on a Wire also left such an incredible feeling in the room, especially with Mark explaining the background to the song. I loved seeing how diverse the audience were. There were all kinds of people, old and young, and it was so lovely to see the music bringing everyone together. The Script are a band with something for anyone who wants to listen, and I think that's why they can attract such an array of different people who all share a real love of music. 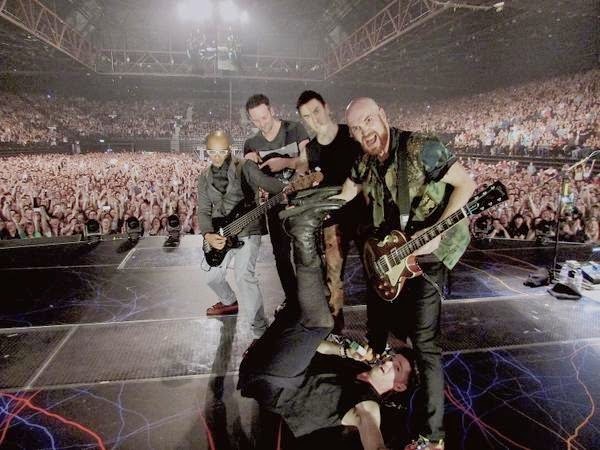 If you never go to see any other band live, make sure you go to see The Script. They'll captivate your heart and warm your soul. They're a band like no other. (I wrote a post on The Script's latest album in September last year, which they performed lots of songs from last night, so check that out here if you're interested (it's a really great album, so definitely have a listen if you haven't already)).